Danielle Cohen began her EMS career at the age of 18 as a volunteer for Port Jefferson Ambulance. 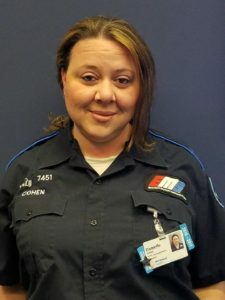 In 2001, Danielle began working at St. Clare’s Hospital in the Hell’s Kitchen area of Manhattan and was among the first EMS crews to respond to the tragedy on September 11, 2001. In 2002, Danielle began her career at Northwell Health where she has worked both in the field, and in Communications. In her private time, Danielle volunteers to help victims of pediatric cancer, a cause very close to her heart. Danielle was selected as a Star of Life nominee by her peers for consistently going above the call of duty. Danielle is always available to help her co-workers, both in and out of work. Danielle also volunteers on committees such as Adopt a Family and Bring Your Child to Work Day.